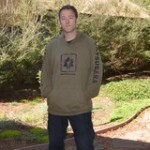 The Datsusara Green Hemp Hoodie is great for all climates due to the porous nature of hemp clothing. Hemp is able to “breathe” which keeps you cool in the heat. In cold weather air gets trapped in the fibers which is then warmed by the body, making hemp clothing naturally warm as well. Both sleeves feature “DATSUSARA” lettering. Note: These run about half a size larger than your average hoodie, size down for a snug fit or hot water wash.
All hoodies are OD Green as in the pictures. We only have Mediums and Larges left.